sometimes hector makes me think of that "daring young man on the flying trapeze with his startling leaps of imagination. this is one of those instances! who would have thought to embed citrus peel roses into the fruit cake and bake it no less. Hector manages to imbed an image of my name in almost everything he does--sweet! 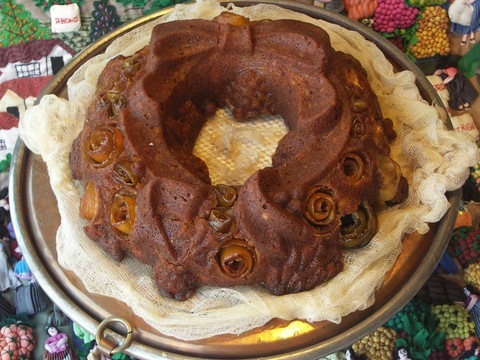 from Hector here is my take for ROSE'S heavenly CAKES: Fruitcake Wreath. i followed the recipe as written, except replacing all the candied fruits with dazzling orange roses and replacing all the nuts with mac nuts. because the orange roses aren't as sweet as candied fruit, i added 220 grams of white sugar to the last 1 cup of rum that is brushed on the cake for the long term storage option. here is a short video with progress photos. the roses going to the jar of rum, the mac nuts been toasted, whisking the dry ingredients, mixing softened butter with dark brown sugar, eggs incorporating, adding the flour. then, using finely diced mac nuts to fill the ribbon part of the pan, adding roses on the pine cone pockets, the filled pan, my thermapen checking for cake doneness, brushing rum, and the cake cooling in the pan. i hope you make this cake soon, the wreath pan is so fun. i do need to disclose that you need to spend 3 hours with a variety of tweezers and dentist tools, to clean up the roses from any cake batter that may have baked on.